Deliberate Action: Chloe's training lacks any significant specialization, rather a varied skill set encompassing a wide range of applications. She demonstrates a giftedness at problem solving, and given the opportunity can usually succeed at most things she attempts. For 1 AP, she can roll a maneuver (Perception or Electronics) using the same skill on both turns. Should the maneuver succeed, she gains a +4 bonus. For 8 XP, she can add one skill to the list that this applies to, capping at 6 skills. Howlite pendant1 - Worn around neck, tucked under clothing. Her Foundation ID card - Worn around neck, tucked under clothing. Registered, personal Seal with ink. Jiyeon Song was born in Seoul, South Korea in 1986. At the age of 10, she immigrated to the United States and stayed for a duration of five years; during this time she became fluent in English. 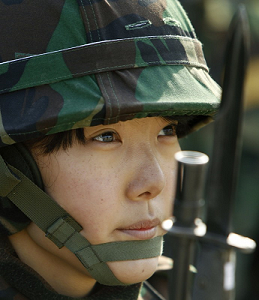 After graduating high school with honors, she enlisted in the Republic of Korea Marine Corps. After six years of service, Jiyeon was offered to be inducted into the Foundation, where she worked as a Field Agent for approximately six months. After voicing requests for more combat/field-oriented work, Chloë was reassigned to a temporary assignment in Mobile Task Force Tau-9. During that time, she attended multiple schools and courses in marksmanship, close-quarters combat, urban combat, and obtained a military diving license. After her training and work with MTF Tau-9, she was assigned to Area-354 as a part of STF-A-354. Chloë is a young Korean woman,. She is 5'6", with very long short black hair, recently cut by Jason Dodridge. She has bangs that frame the sides of her face. She's not beautiful but not plain, with a boyish face that has a feminine softness. She likes to wear comfortable clothing and combat boots in her free time, but usually wears her duty dress. She likes to listen to K-Pop love songs, but arguably doesn't have the best taste in music. She is a talented soap and wood carver and not a bad writer either. Her hobbies include soap and wood carving and writing short stories, although she has been trying her hand at wood carving recently. She has a sister named Jihye, and a niece named Chaeyeon. Her favorite pizza is a homemade margherita pizza with extra cheese. 1. For patience, helping in anger issues, and awareness, along with a few clearing properties as a result.